3-4 minutes before adding it to the dish. Cook the orecchiette in boiling water for 1-2 minutes less than the recommended cooking time. Drain but do not rinse. While the pasta is cooking, saute garlic and red pepper flakes in oil in a saute pan for 1-2 minutes. Do not allow garlic to brown. Add spinach, salt and pepper. Saute until spinach is wilted. Add broth and simmer about 5 minutes. 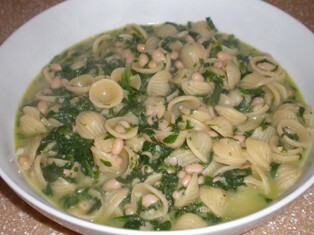 Add beans, butter (optional), and drained orecchiette to the broth mixture. If you are including sausage, add it at this time. Stir to combine and cook 1-2 more minutes. Transfer to a serving dish. Sprinkle with Parmesan cheese. TIP: If you under cook pasta by just a minute or two and then add it to your sauce to finish the cooking time, the pasta will absorb some of the sauce and be more flavorful. From pasta to soups, this versatile stock pot makes gourmet cooking a breeze. Multipurpose 8-quart set lets you steam, boil and cook up all your favorites. Three piece set includes outer pot, strainer insert and lid. Bronze molds are still used in order to obtain the surface "roughness" which allows sauces to adhere to the pasta. This multipurpose serving bowl is ideal for serving Parmesan cheese at the table.